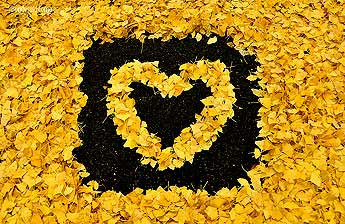 Lovely photo of golden Ginkgo leaves: "Heart of Gold". Photo by bondesu in Japan (Flickr.com). 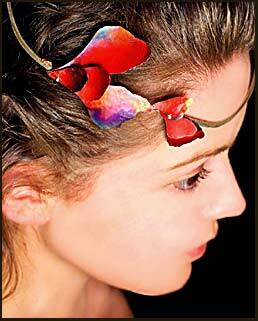 Beautiful handmade Ginkgo jewellery made in Athens by the Greek designer Lily Fragaki. Ginkgo in fall impressions - 2009. 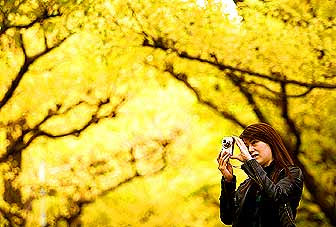 A woman takes a picture of the fall foliage of Ginkgo biloba trees in Tokyo, Japan. View enlarged photo on Photo Journal blog of the Wall Street Journal (Nov.16th, 2009). The leaves of Ginkgo trees can all fall in a short period of time, sometimes in one or two hours! This is recorded in many parts of the world in fall. A selection (from YouTube, thanks to all videomakers!) is presented in a playlist I made of "Ginkgo Day" videos. Come back soon to see more videos. Read the poem "The Consent" by Howard Nemerov on my website here. I decided to make chawan mushi, a savory egg custard with little treasures hidden within. 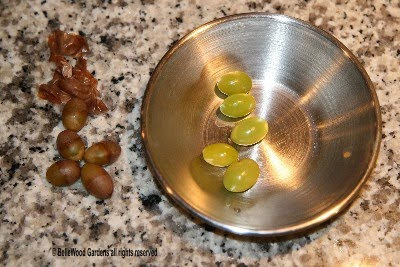 ..."
Read full article (including a recipe for chawan mushi) here. * Added video on Tree-page: Playlist of my videos on YouTube of the Ginkgo as a street tree. * New video: Music "Ginkgo - Ityo"by Yusuke. * New topic: UN Secretary-general Ban Ki-moon plants Ginkgo tree. * New video: HD video of old Ginkgo at Hachiman Mito shrine, Japan. 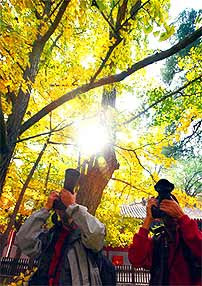 Visitors take snap shots of golden Ginkgo leaves in fall at Dajuesi Temple, Beijing, China. about 40 trees, also female. Buildings Amsterdam School style of architecture (Dutch: Amsterdamse School). Video taken Nov. 6, 2009. 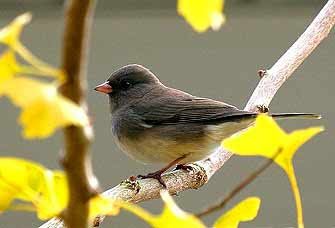 Junco bird in the Ginkgo. This photo can be seen on Flickr.com and is made by eastcoastfocus in her garden in Canada.